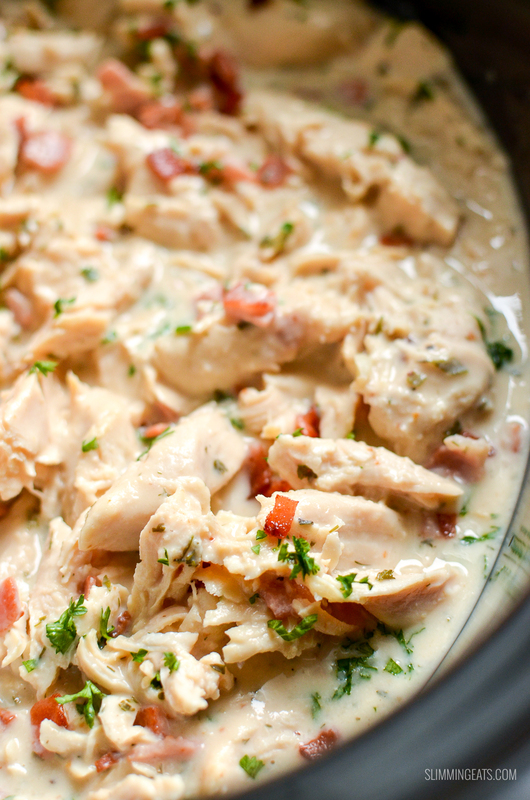 Healthier Slow Cooker Crack Chicken – the ultimate family-friendly creamy chicken recipe topped with the yummy smokey flavour of bacon. Oh my!! Ever browse recipes on Pinterest and constantly be drawn in by something that looks amazingly delicious? only to then be disappointed by the highly calorific ingredients that would bust your syns allowance for the day. Crack chicken is a popular dish this side of the Atlantic, in the US and Canada and I regularly see it being made on the Instant Pot community on facebook. 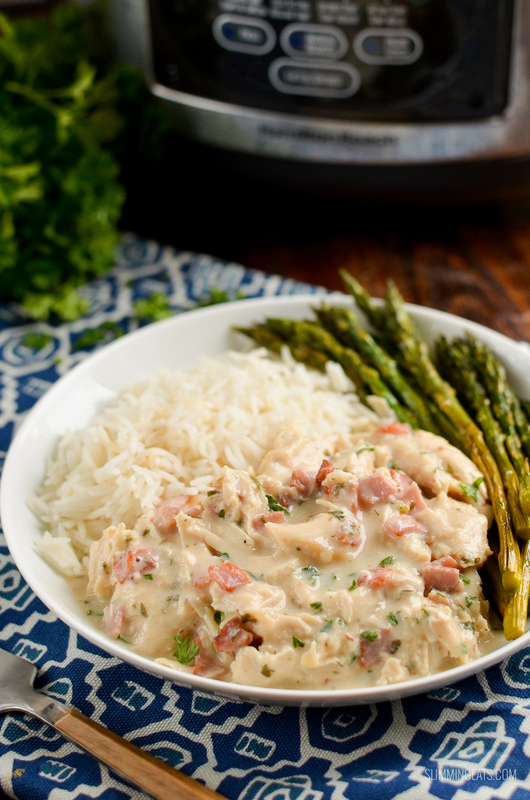 So after finally being able to source some lean back bacon (something which is hard to find where I live in Canada), I set myself the task of creating my own low syn healthier version of Slow Cooker Crack Chicken and oh my gosh is this good. 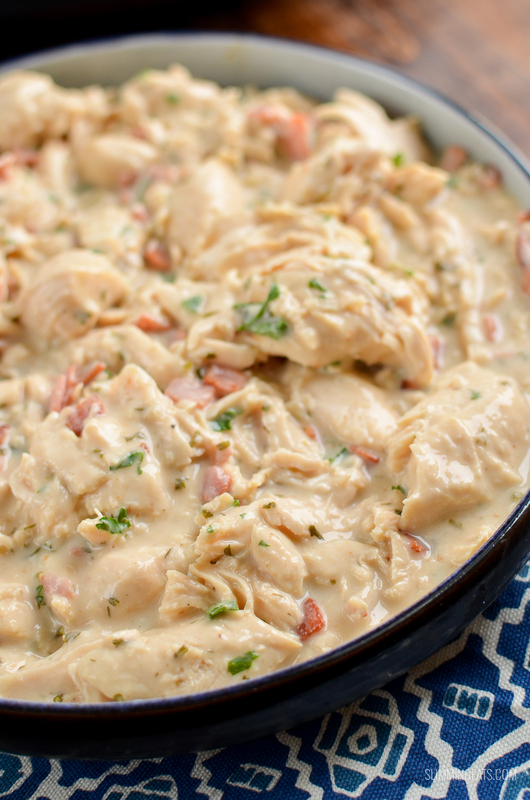 Traditionally this is often served in a bread type bun or roll, very much like a sloppy joe, except of course it’s not tangy tomatoey ground beef, but instead is a creamy calorific shredded chicken in a creamy ranch kind of sauce. Yum!!! I am not too impressed with most of the ready made ranch seasonings packets you can find in the supermarket, mainly because most contain MSG which is an ingredient that I choose to avoid where possible and therefore homemade ranch seasoning was the best option. Traditionally ranch dressing or seasoning comes with buttermilk, but as I was using low-fat cream cheese, I figured I would skip that out of my homemade seasoning and keep the syns down. Usually, we can count cream cheese as a healthy extra, but with the changes coming to the programme in January, cream cheese of any kind will no longer be a healthy extra A choice, so for this recipe, we are synning the cream cheese. I use low fat Philadelphia which here is 1 syn per 15g (one tablespoon), in the UK if you use the Philadelphia lightest, it is only 1.5 syns per 30g, so a little less than the one I use. 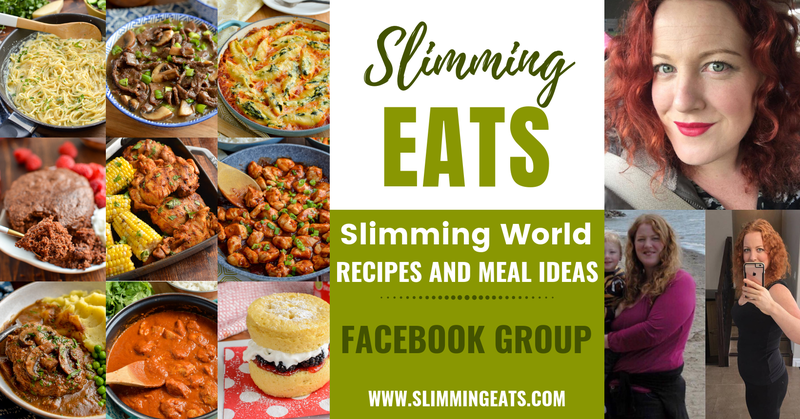 Obviously, the syn calculations on this recipe, are going by the ingredients I use, so adjust and calculator the syns for the ingredients you use if you are using a variation on that. You can also use store brand cream cheese, it doesn’t need to be only Philadelphia, just make sure you do not, however, use quark, as it won’t work in this recipe, will split the sauce and will not yield the same taste. When it comes to how to serve this Slow Cooker Crack Chicken, you can still serve it in a bread roll if that’s what you fancy, by using a 60g Wholemeal Roll which is a healthy extra B choice. 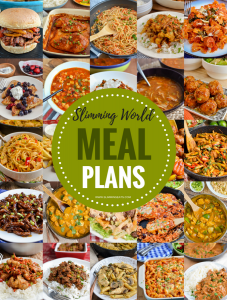 Other than that, this will pair really well with so many different sides from rice, potatoes (mashed, roasted, steamed) or even syn free chips or pasta – yum!!! The chicken is super tender from being cooked slowly on a low heat. Which is often hard to accomplish with Chicken Breast. I just recommend not leaving on the keep warm setting for a long period of time once it has completed cooking if you can, as the long it sits it will start to dry out the meat. Slow cookers or crock pots are such a great kitchen item to have, especially if you live a busy lifestyle. One like this Morphy Richards Sear and Stew Digital Slow Cooker is a great option because it means the inner dish is safe to use on the hob if you need to brown anything before setting it to slow cook. 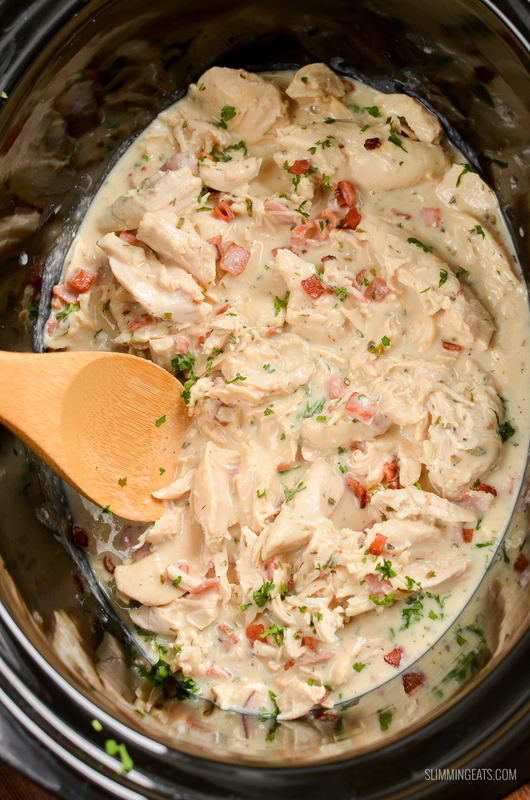 But if you own an Instant Pot you can also use the slow cooker function to cook this Slow Cooker Crack Chicken. Wondering what an Instant Pot is – It is basically a 7in1 cooker, and it slow cooks, pressure cooks, saute’s, has settings for soup, chilli, rice, porridge and even makes yoghurt (I haven’t tried that yet). 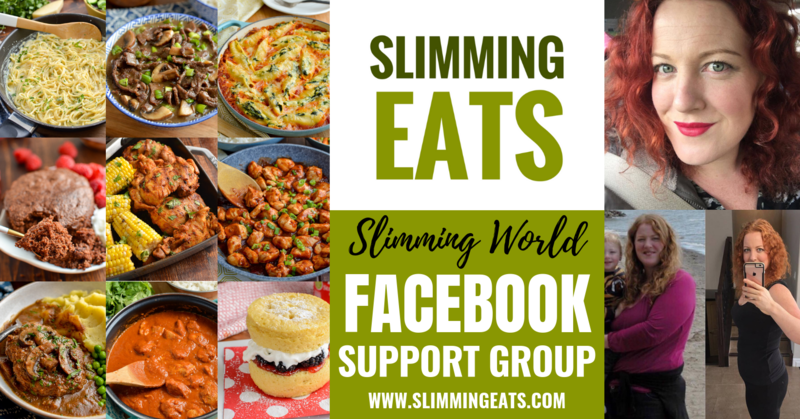 tap/click to go directly to the group so you can request to join. How can I add a 1/3 speed foods to this Slow Cooker Crack Chicken? I served mine with some roasted asparagus. I just trim a bunch of fresh asparagus, add to an oven proof dish and spray with olive oil cooking oil spray, a pinch of sea salt and black pepper and then roast until slightly browned on edges and tender. So yummy. This will literally serve well with any greens of your choice. 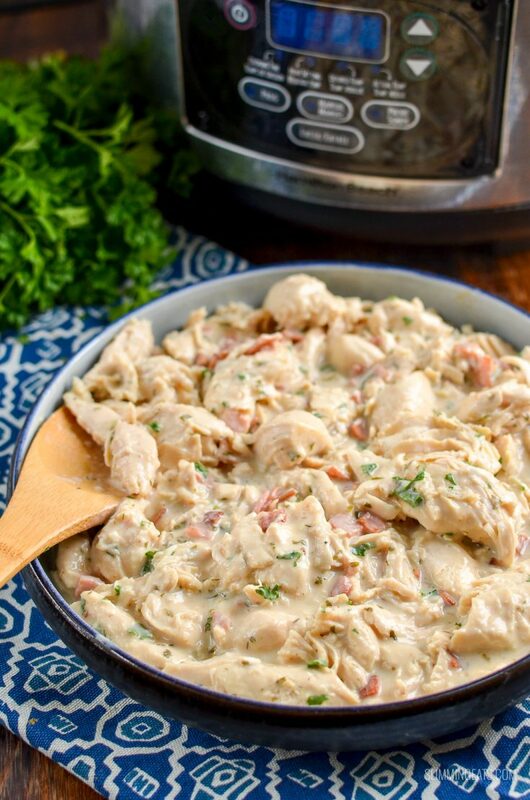 What Kitchen items do I need to make this Slow Cooker Crack Chicken? 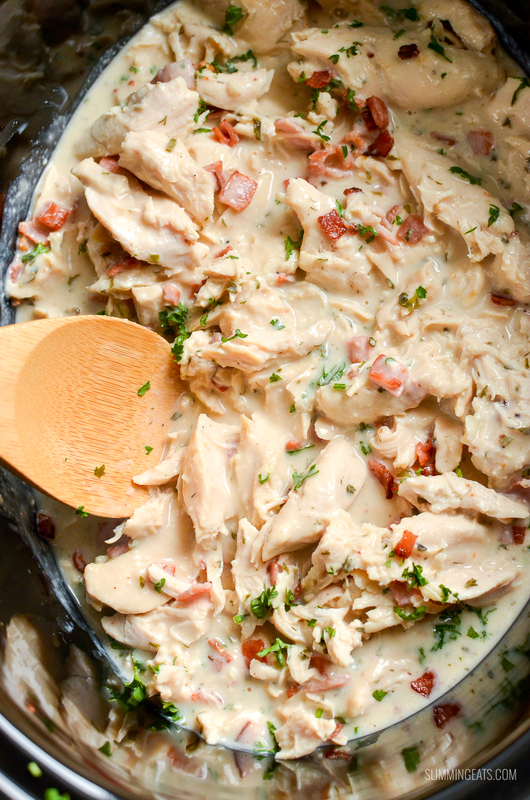 Healthier Slow Cooker Crack Chicken – the ultimate family-friendly creamy chicken recipe topped with the yummy smoky flavour of bacon. Add the shallots and garlic and fry for a minute or so to infuse the garlic, add in a little bit of water to prevent sticking if needed and fry until softened. Add this in the slow cooker, with the cream cheese, stock, dried parsley, dill, chives, onion powder and garlic powder and whisk until all combined and no lumps of cream cheese remain. Place in the chicken breasts, set to low for 5 hours, slightly ajar lid for the last hour to help the sauce thicken. When the chicken has almost finished cooking in the slow cooker, spray a frying pan over a medium high heat with cooking oil spray add the chopped bacon and fry until golden all over. Once chicken is finished the time in slow cooker, roughly shred the chicken into the sauce with two forks and stir in the bacon. Season as needed with salt and black pepper and sprinkle with chopped fresh parsley. Hi! 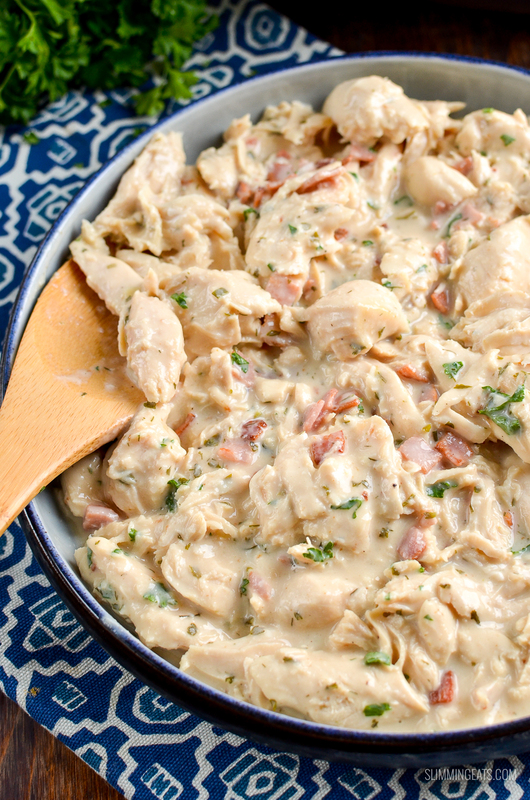 Just wondering whats the ingredients for the slow cooker crack chicken and how do I cook it. 90 gms of ricotta is still a healthy A choice in the new book, so i will be making it with that so i can have it syn free. Sounds fab. I personally wouldn’t recommend ricotta for this as it will likely split and curdle. If you don choice to use it, I wouldn’t wait till the very end to add it in. Hi how many people does this serve? Would it make enough for 3 people to have with rice? I am out at work from 7am – 6pm ( so 11hrs approx) – can I leave the slow cooker on for this time on a low heat or will it not work with this recipe? The chicken may end up a little dry for that length of time. Sounds delicious! 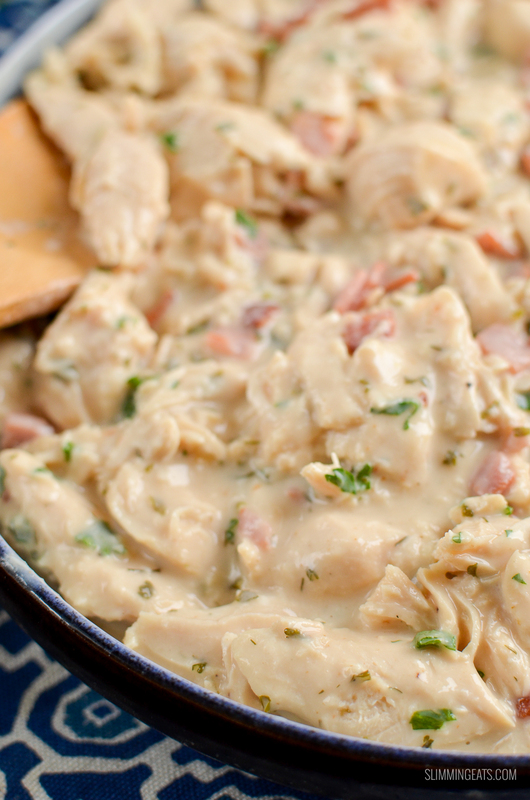 Any idea how I could make this without a slow cooker please? Thank you. Hi is this suitable for freezing? yep it sure is 🙂 – You might need to add a little stock to prevent it going to dry when reheating. garlic does add flavour to recipes, but if you really dislike it, they should be fine without. How many oz is one serving? Hi the whole recipe serves 6 people, so divide the dish into 6 for one serving. I don’t measure the ounces or grams per serving once cooked. Had this recipe on the “to try” list for a little while as it seems to be trending on the Facebook page at the moment. Delicious – everything it is cracked up to be! Even the other half who is not keen on cream cheese sauces loved it. Made it onto the ever expanding list of favourites in our household. Thank you SIobhan – another triumph. Could I use cottage cheese instead of cream cheese? No it must be cream cheese in this recipe. Enjoy!! What do you mean by cream cheese? Do you mean like Philadelphia or dairylea? I am desperate to try this, but currently am not allowed lactose or fructans. I can get a lactose free soft cheese which is like Philly, but it will have quite a lot of syns as it isn’t low fat – I will just have to save up syns for that. My biggest problem is fructans, as it means no onion or garlic at all. I can use a garlic spray oil which is fine, but can’t use shallots, or the garlic and onion powders. I am allowed the green parts of spring onions (scallions), so would they work instead of shallots? And would asafoetida work instead of the powders, or is there something else? We are slowly working through our favourite recipes of yours and adapting them for what I am allowed. Any help would be fab thanks! the green part of spring onions should work for that flavour, you could maybe even go for some grainy mustard if you are okay with that, slightly different flavours but should work well with the creaminess. It may just be a case of adding in a few things for flavour which you can eat and seeing how it goes. Hi can I substitute cream cheese with quark? Hi Katy, quark can’t be used in this recipe (as stated in the write up) it will split. I use low-fat Philadelphia, but any store brand one is fine too. This is def in the menu in the next few days. Had this tonight with brown rice and asparagus. Was delicious. Does this recipe taste cheesy? The recipe sounds delicious and I really want to make it, but my husband doesn’t like cheese at all. Hi, tried this recipe the other day, its delicious!! However not as much time today so can it be cooked on high for a shorter time or would it be a problem with the cheese? 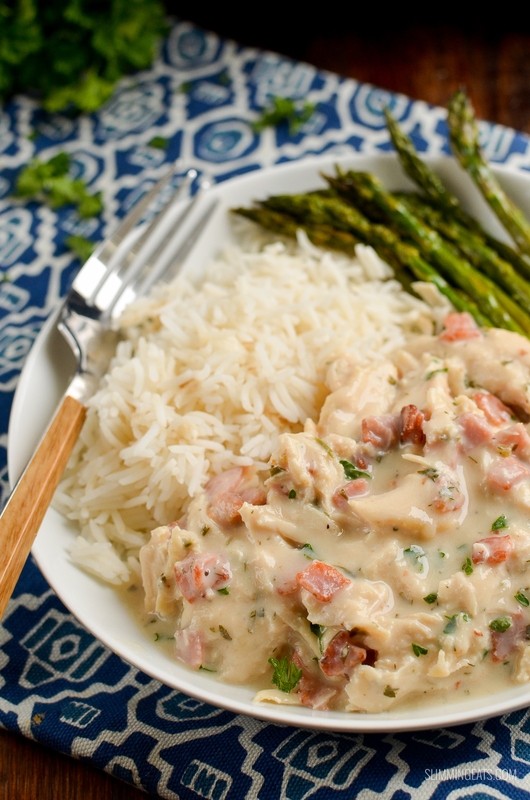 Hi Phoebe – you can simmer it all on the stove top – takes about 20 minutes – enjoy! !